The probability and potential of roulette could easily be estimated and the primary reason behind this is the fixed probabilities of the game. Every roulette wheel being spinned has an independent result and will not be reliant on previous throw with no complex results. 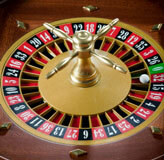 These days online casinos offer safe and convenient roulette games to play. Many online casinos offer variations of the game such as American roulette, European roulette, Live dealer roulette and even Multi Wheel roulette. When playing on a neutral wheel the 38 slots makes probability of playing as 1/38. According to which worth of the all potential gambles can be estimated by presuming house edge. Most of games do not consider zero plus double zero and hence one must not overlook it. The wheel has 38 slots with 2 zero and 36 as the residual slots. In the wheel there are equal divisions of red and black which makes the number 18 and the potential will be 18. Thus, the estimation of winning will be 18/38 which is 47.37%.And the potential of defeat will be 20/38 which is 52.63%. Ever won or loss game will gain $1 or loose $1 respectively. When considering of 380 odd spins of the game, an individual could gain $180 however will miss on $200.Thus the potential of loosing will land up to $20 and thus the potential of winning is low. 5.26% or it can be calculated as $20/380 = 1/19. Idea and arithmetic of roulette shows that every gamble has identical house edge, apart from complex zero, double zero - 1- 2- 3.When analyzed the previous example it has been found that house edge will land up to 7.89% for the gamble. When followed for straight up bets which have the potential of 35:1, one would find similar results. House edge however decreases for European wheel as it does not have additional zero. The American wheel has an edge of two percent more on house edge. House edge remains constant on every wager and thus will not interfere or change the results statistically as they will give in the same outputs. Thus you get to gamble on either relying on your guess work or the bet management system. Although roulette at reputable online casinos are safe and fair, some people still feel uncertain about the outcome of RNG roulette wheels. To overcome this, some online casinos offer live dealer roulette. In a live dealer roulette game there is a dealer physically spinning the wheel. You place bets as you would at a land based casino. There will be a time limit in which to place your bets, and the dealer will call "no more bets please" when the time is up. Live dealer roulette tables have different table limits, so make sure you check before you bet. In multi wheel roulette There is a single betting table, but each bet placed is multiplied by the number of wheels enabled (maximum 8 wheels at a time). you can enable or disable wheels by simply clicking on them. Having multiple wheels spinning simultaneously increases the chances of your number coming up which increases your chances of winning.